I know wallpaper can be intimidating, but like most things you've just got to take the risk. I've used pre-glued, not pre-glued and as of late, peel and stick. All of them are fairly simple but probably the easiest and most forgiving (and reusable! although I haven't attempted to re-use yet) is peel and stick. Here is a step by step process using paper from my partnership EazyWallz, you can find the exact paper I chose HERE. Our mural came in 5 strips and it was custom cut to fit the wall. 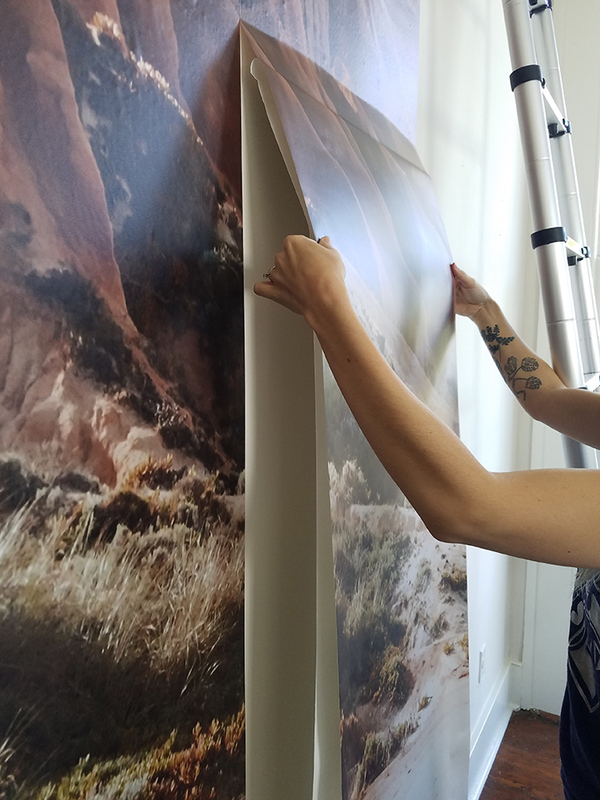 This type of wallpaper can easily be hung by one person but since our ceilings are so tall and we had to use a ladder it was much easier with two people for the top portion of the mural, once we reached the height that didn't require a ladder I was able to apply it alone. First: peel back about 4-5 inches of the backing across the top. Press that strip onto the wall. Next: slowly and evenly pull the backing away, as you do this press the paper on to the wall. If you notice wrinkles or bubbles you can easily peel it off the wall and readjust. That's it! A couple tips though... After you have applied the first strip of the mural to the wall make sure when you start the second piece that everything lines up pattern wise. If you notice that the pieces are starting to overlap as you place the second strip at all you cannot just stretch the paper to correct because by the time you reach the end of the mural the whole thing will be askew, so peel it off and start over. Also, although you can remove the paper and re-apply you need to be very careful because the paper loves to stick to itself, it will come apart but it's no fun. I had the pleasure of talking with the women from Little Yellow Couch where we discuss design projects from our home and Winnebago.